Isaac Asimov is one of my favorite authors. He wasn’t exactly a master of prose, but he was definitely a master of ideas. He got more mileage out of three laws of robotics than most authors get out of a whole notebook full of ideas. 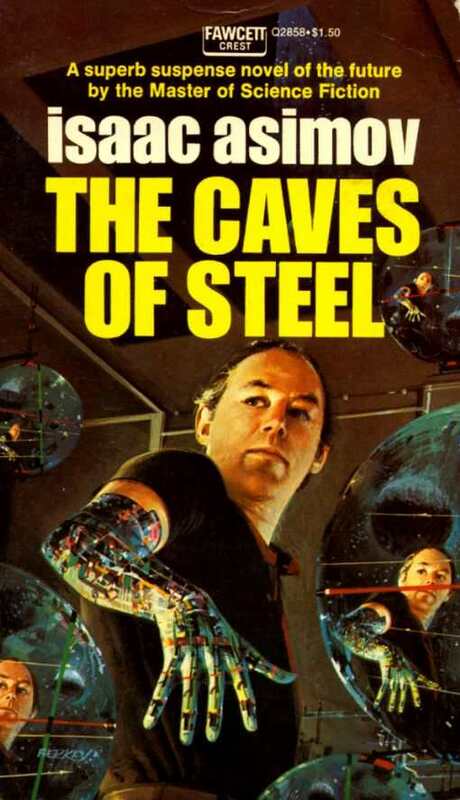 His later fiction strays into some weird territory (not a big fan of the Gaia sections of the Foundation series or of the direction he takes some of the later robot novels), but one of his early works, The Caves of Steel, is one of my favorite books and an indirect inspiration for one of the characters in Surreality. The Caves of Steel is a science-fiction mystery. The earth of this world is densely populated, with most of the population living in vast underground cities. Some colonization of outer worlds has begun, but the population of those planets is kept deliberately low to allow for increased wealth and extended lifespans. Robots are all but banned on Earth, whereas for the Spacers (the outer colonists) robots are an essential part of maintaining their lifestyle, and are advanced enough as to have a human-like appearance. When a Spacer ambassador to Earth is murdered, Elijah Bailey is partnered with spacer robot, R. Daneel Olivaw, to solve the case. Olivaw serves as a guide to Spacer culture and robots for Bailey, who’s a bit of a curmudgeon (his catch phrase is “Jehosophat!”), and doesn’t trust that the three laws are enough to keep a robot from being responsible for the murder. He also doubts R. Daneel’s capabilities as an investigator, since he is merely a program without the instinct or understanding of human emotions of a true detective. Surreality is what I call a technological-mystery, though one of its characters, an advanced artificial intelligence, borders on science-fiction. Synthia, short for “Synthetic Intelligence-Algorithm”, is assigned to Detective Keenan when he is tasked with investigating a murder in the virtual world of Surreality. She serves as his guide and partner, since Keenan is a man not familiar with computers, or with this game world in particular. Keenan has some of the same doubts about Synthia’s abilities, and building their partnership through the book presented some of the same challenges, ups and downs. In the world of Surreality we’re presented with three kinds of in-game characters, avatars, or characters controlled by real-life players, NPC’s “non-player characters” that serve as background ornamentation to the game’s environments, and artificial intelligences like Synthia, who live in the game world, but are more than just a few programmed responses. “Of course I’m real. I’m as real as everything you see here,” she laughed. “I’m not real in the sense you mean, as in a human controlling a puppet in here, but I am real. My full name is Synthetic Intelligence Algorithm, or Synthia for short. Pleased to meet you.” She gave a little mock salute. Synthia’s a little feistier than Daneel, and doesn’t have the same explicit restrictions. Truthfully she’s fun to write, and probably one of my favorite characters of the whole book (probably why she made the cover). There are things we’ll trust to computers, journals, blogs, that we might never say to the people in our lives. And characters like Synthia give voice to perspectives outside of the patterns our characters are used to operating in. PS. Thanks to my mom who suggested I read The Caves of Steel back in the day. Hi Ben, cool write-up of The Caves of Steel and how it related to your book! I’ll have to see if I can add Surreality to my lengthy reading list.